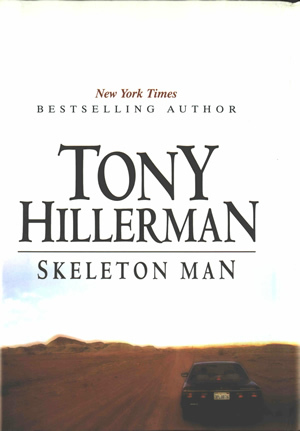 This is the UK hardcover edition of Skeleton Man, published in 2005 by Allison & Busby, London, England. The dustjacket is white, with a desert landscape photograph along the bottom featuring a dirt road and the rear of a 1980s model Toyota Camry in the foreground. The publisher's logo, author name, and book title are printed horizontally on the spine.